New nominal (BAU) in blue, former BAU in red. Introduce Emissions per ha Grassland Conversion (17 GtC/ha, or 20% of forest carbon stock). This is multiplied by Agriculture Other Land Allocation Rate, to calculate a contribution to C Emissions from Land Use Conversion. Eliminate FAO Fertilizer Emissions (Fertilizer Emissions Factor == 0). These are already included in non-CO2 forcings (nominally RCP 4.5), and associated uncertainty is covered by RCPs 2.6 - 8.5. These emissions previously constituted 14% of LULUC sector emissions in 2011. Decrease Climate Sensitivity to 2xCO2 to 2.5 W/m*m (from 3.0). This brings Temperature Change from Preindustrial into better agreement with HadCRUT4 and GISS anomalies, and is in line with the IPCC WG4 central value (2.5 W/m/m) as well as the WG5 range (1.5-4.5 W/m/m). Increase Flux Atmosphere to Ocean to match IPCC WG5 data by decreasing Ref Buffer Factor by 20%. Increase Energy Demand 1900 Calibration from 120 Mtoe/yr to 500 Mtoe/yr to match emissions data for the early industrial period. Despite the large increase, this is a very minor effect. Reduce Coal Price toe and Oil Price toe during periods [1900-1940] and [1920-1980], respectively, to better match historical data. 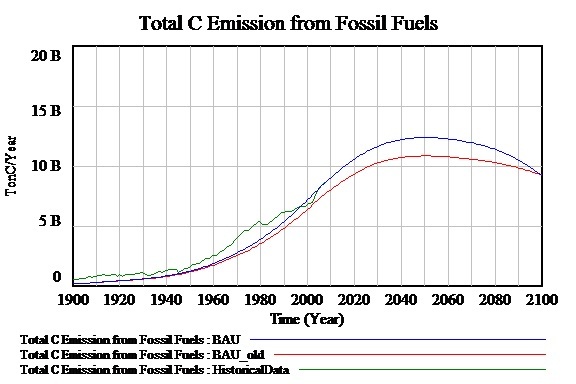 Increase C Emission from Oil Energy by 2.5 GtC (cumulative) between 1900 and 1950 to match emissions data for the early industrial period. Increase C Emission from Coal Energy by 12.5 GtC (cumulative) between 1900 and 1950 to match emissions data for the early industrial period. Recalibration of nominal Energy Demand per Capita - included annual geometric increase of 0.1% in per capita energy demand over period [1900-2100] (above at right). This change affects Total C Emission from Energy Sector, Net Emissions, Atmospheric Concentration CO2, etc. The effect will be correlated across most scenarios, so impact estimates should not change by any significant amount. The former baseline can be recovered by setting Energy Correction Annual to 0.000 in the Energy_Market Share sector of the model. Include agricultural residue collection and processing from 10% of arable land (5.5 Gt/ha/y) for bioenergy production (up to 14EJ/y in 2100). Collection area is scaled linearly over 20 years beginning in 2015. Previously, there was no collection of residues in BAU. Include carbon penalty for conversion of natural to managed forest. Penalty is equal to 50% of areal forest carbon stock (nominally 85 tC/ha), spread out over ten years after land use change. Changed Potential Land Based Biomass Production to Actual Land Based Biomass Production when calculating carbon credit for bioenergy production (Carbon Storage in Biomass for Energy). 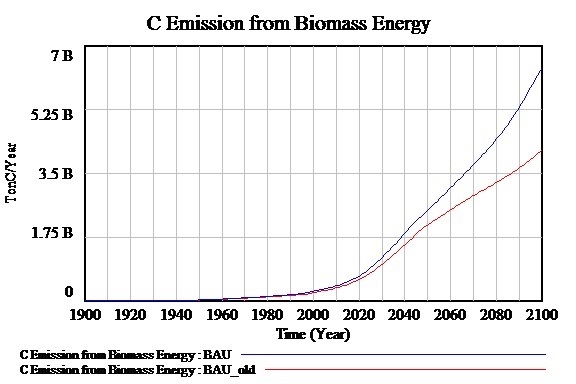 This corrects a bug which overestimated carbon credits (by about 1 PgC in BAU and 0.2 PgC in all BioEnergy-class scenarios) when Potential Biomass Energy Production from Resources outstrips Potential Biomass Energy Production from Infrastructure or Total Biomass Demand. Changed Life Expectancy Normal from 28.6 years to 29.2 years to match WB data & WPP MedVar projection. Berndes, Göran, Monique Hoogwijk, and Richard van den Broek. "The contribution of biomass in the future global energy supply: a review of 17 studies." Biomass and bioenergy 25.1 (2003): 1-28. Felix requires Vensim software, which is available for free download at www.vensim.com.